Nestled between the bustle of Tampa Bay and Ft Myers lies the paradise of Manasota Key. Combining old FL charm featuring homes instead of hotels/condos, with the white sand beaches, restaurants & amenities that attract our vacation friends, the secret is out, and this area is hot while remaining tranquil. With the serenity of Lemon Bay's offerings - kayaking, paddleboarding, variety of fishing, birding & sightseeing - along w/the beautiful Gulf beaches, snowbirds and locals alike are making this home. Now so can YOU - with HUGE investment opportunity! Enjoy sunset views from this luxury duplex steps from the Gulf, with deeded beach access. Live in one side & rent the other, OR rent both sides year-round! NO RENTAL RESTRICTIONS- impossible to find this opportunity on Tampa Bay beaches & other islands! Identical layouts - ground level oversize garage, 2nd level holds bedroom & full bathroom, laundry, open living/kitchen/dining with new granite counters & appliances. Plantation shutters encase the partial gulf view from the front deck, plus enjoy a screened rear balcony. Up another level lies new waterproof flooring in an ensuite bed/bath w/private screened balcony - full gulf sunset views! Bath features large tile shower & new vanity. Handicap-accessible with an elevator on one side to second level only. Door connects both sides to allow entire home rental, too! NEW HVAC, fresh RhinoShield on decks/steps! 45min to Punta Gorda airport w/Midwest, NE direct flights! 3D walkthru link in virtual tour below. 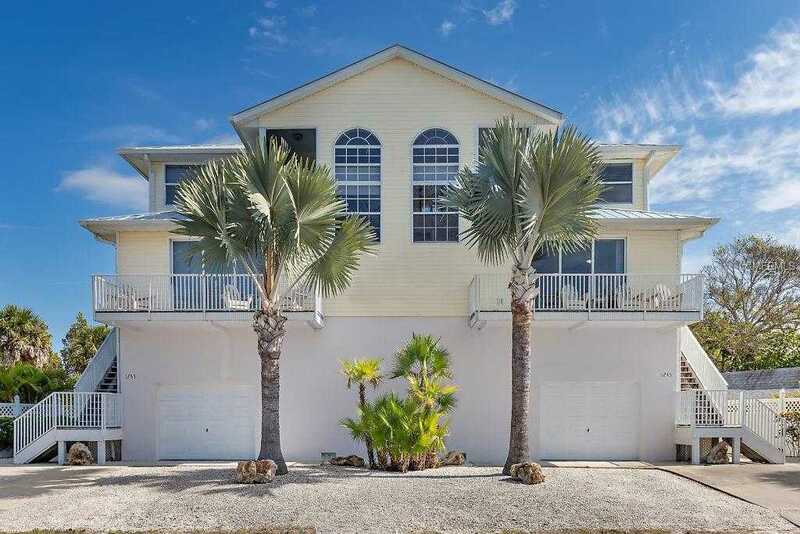 Deeded beach access across street to private area of white sand beach along the Gulf! Public beach access points about a .5-1 mile in either direction as well. Please, send me more information on this property: MLS# U8032897 – $796,500 – 1245 Shore View Dr, Englewood, FL 34223.